Summary: Alisa Perne is the last vampire. Beautiful and brilliant, she hunts alone, living among humans, living off humans. But someone is stalking her. Someone wants her dead. And Alisa has a choice to make – to keep a long held promise or protect the mortal she seems to be falling for. Oh god, here we go. 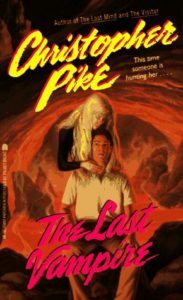 Five years into recapping on Devil’s Elbow, and I’m finally spending an entire year focused on my favourite of the 80s and 90s teen horror authors, Christopher Pike. I’m saving my absolutely favourite books for the end of the year, but first, I’m taking on The Last Vampire series, which is significantly longer now than the first time I read it. Note: There’s a lot of religion throughout this, particularly centered around Krishna and Vishnu. I do some basic research as I read, but I have very little knowledge here. My guess is that Pike’s taking a ton of liberties. I think that reading this as an adult, it’s going to smack of cultural appropriation, so keep that in mind when you read the book and this recap. I loved this series growing up, especially the first book, but oh my god, does it get weird. So weird. Complicated and twisty and fun, but weird. Though I’ve reread a lot of my Pike books often, this is not a series I read more than the first couple books obsessively, so I’m excited to go through the entire thing again. 2018: The Year of Christopher Pike. Let’s do this.